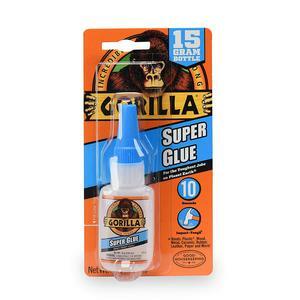 Its high strength and quick set time make Gorilla Super Glue the go-to adhesive for a variety of household projects. Developed for long-lasting repairs in an instant, the clear glue dries in 10-45 seconds. Our Super Glue is formulated for increased impact resistance to handle bumps and drops. We call it Impact-Tough™ because the reliable bond stands up to wear and tear. In addition to Gorilla Super Glue’s high-performance cyanoacrylate formula, we’ve added an anti-clog cap with a metal pin inside ensuring an airtight seal for maximum reusability. It’s Gorilla tough, every time. Formulated for impact resistance and strength. Bonds plastic*, metal, wood, ceramic, paper, rubber and more! Dries in just 10-45 seconds, with no gripping required. Keeps super glue from drying out. It’s Gorilla Tough use after use.